Now that the hubbub of Nisei Week is over, it's time to take a good, long look at your dirty ole car... My car? Yes, this Saturday, August 29, the youth who live at Casa Heiwa on the edge of Little Tokyo are having a car wash fundraiser and they're hoping you'll come out to support them, visit awhile and get yer car washed. 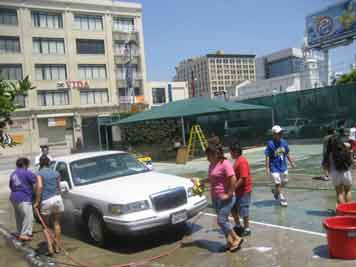 The Little Tokyo Teen Group will be having a CAR WASH this Saturday. Walk-ins are welcomed... small cars will be $5 and large vehicles will be $7. They will also be selling soft drinks, water, and delicious Slushies.